Professor Osamudia James, recently named as vice dean, has a deep understanding of the evolving relationship between the law and individual and group identity. James believes U.S. courts have been very good about advancing formal equality under the law, but increasingly produce legal doctrine that ignores identity. “The courts present color-blindness as the goal to which society should aspire, while insisting, for example, that race has increasingly little to do with contemporary legal or social problems,” she said. However, James says that the continuing marginalization of people by race, gender, class, or sexual orientation defies that thinking. “Study after study shows that societal disparities having little to do with individual merit, and a lot to do with structural inequality, still exist in our country,” she said. James considers both the good and the bad sides of identity in her scholarship. Concerned about the impact of diversity programs in U.S. higher education, she has argued that even when affirmative action policies enable increasing numbers of black students to attend U.S. colleges and universities, the policies can also perpetuate racial subordination when improperly deployed. In her 2014 article, “White Like Me: The Diversity Rationale’s Negative Impact on White Identity Formation,” published in the New York University Law Review, James noted that diversity policies are justified as beneficial to white students who can grow through encounters with minority students. “This thinking can reaffirm notions of racial superiority and service, perpetuating an old story about using black and brown bodies for white purposes on white terms,” she wrote. Instead, James believes colleges and universities need to go beyond affirmative action and create a culture of belonging—a theme also emphasized by University of Miami President Julio Frenk, Jr., who cited her work in “Why We Need a ‘Scholarship of Belonging’ in the May issue of the Chronicle of Higher Education. Emphasizing the importance of embracing diversity in all its dimensions, Frenk asserted that the representation of minorities means little if they do not have a sense of being at the right place, where who they are and what they do matters. The importance of affirming “who people are” informs her more current work. Engaging with the more rewarding aspects of identity, James argues in her current scholarly project that celebrating and recognizing identity can have a positive impact on society. 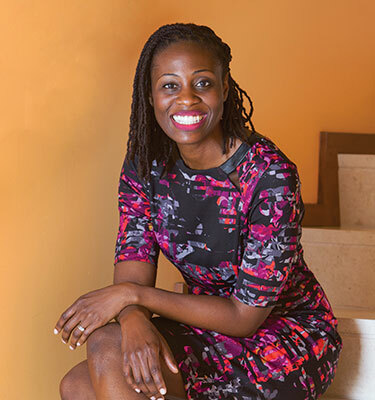 After earning her law degree, James entered private practice as an associate with King & Spalding in Washington, D.C., before returning to school in 2008 at the University of Wisconsin as a William H. Hastie Fellow and earning her LL.M. James joined the University of Miami faculty in 2009 and five years later received tenure at the School of Law. In 2014, she was named a co-recipient of the Derrick A. Bell, Jr. Award. Awarded annually by the American Association of Law Schools Minority Groups Section, the Derrick A. Bell, Jr. Award recognizes a junior faculty member who, through activism, mentoring, colleagueship, teaching, and scholarship, has made an extraordinary contribution to legal education, the legal system, or social justice. On the personal side, James and her husband Kamal, a teacher at Gulliver Academy, have a daughter Kisaye, 7, and a son Kamal, 4. She has served on the advisory board of her son’s preschool, encouraged diversity in the curriculum at her daughter’s public school, and facilitated anti-bias curriculum training sessions for local institutions. An avid reader, she notes that the “best” stories are those with characters who must grapple with their own identities. One of her recent favorites is Everything You Never Told Me, a novel about a Chinese-American girl’s death that also explores her family’s racial and ethnic identity. In her classes, James also prompts students to consider how state and federal laws impact different groups in society. She notes that tort cases can affect men differently from women, or the rich differently from the poor, such that individual identity can significantly impact one’s experience with the law. In commentaries published by The New York Times, The Washington Post and other national publications, James has written about various aspects of identity and the law, including the impact of “school choice” policies on white and non-white students. “The values underlining school choice rhetoric like privacy, competition, independence, and liberty are inherently incompatible with the public school system,” James said in “Opt-Out Education: School Choice as Racial Subordination,” published in the Iowa Law Review in 2014. Elaborating, she explains that, unchecked, these values can perpetuate and aggravate racial inequalities in American education.